NEW YORK, New York — On February 21, 2011, preeminent telemedicine leader and professor, Dr. Ronald Merrell of Virginia Commonwealth University in Richmond, began his lecture at 8 a.m. EST. The only difference was that it was 5 p.m. for the attendees. And they were in Yerevan, Armenia. With a lecture exploring the status and trends of telemedicine in the United States, Dr. Merrell briefly traced its history, from 1972 when the term was coined to present day, as the field continues to rapidly change with the explosive expansion of the Internet and proliferation of social networking. Doctors, students and healthcare professionals at Yerevan State Medical University listened intently, already well-versed in the advantages of such a healthcare delivery model in Armenia and Karabakh in light of the numerous rural cities and villages. 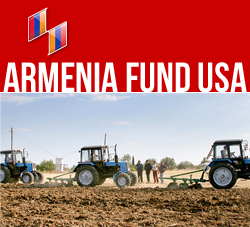 The lecture came on the heels of Armenia Fund USA formally sealing its partnership with YSMU, the Fund’s principal partner in HyeBridge Telehealth. Mobile medicine enables doctors to monitor a patient’s progress remotely via the patient’s smart phone and the doctor’s access to a web-based management system, constituting a part of home medicine, in which similar multi-faceted devices collect information, often supplemented with video consultation. Mobile medicine may also include automotive units equipped with satellite features that allow for consultation en-route to a stationary facility while home medicine is especially important to the rural areas of Armenia and Karabakh, as it allows for post-surgical care, for example, of patients once they return to their homes in villages difficult to access and far from hospitals. The damage inflicted to Armenian healthcare by a lack of resources is assuaged in small but significant part by telemedicine, which allows for doctors and nurses to be two places at once. The promise and demonstrated improvement that telemedicine brings to healthcare delivery has led to the expansion of Armenia Fund USA’s HyeBridge Telehealth program to Vanadzor Hopsital No. 2, the recent recipient of a Polycom unit that will allow the center to benefit from the program on all levels. Along with strengthening and expanding the educational component of HyeBridge, the program continues its live consultation sessions between doctors in Armenia and the United States, sessions which serve to lend support and expertise on cases difficult to diagnose. A young Armenian-American pediatrician, Tsoline Kojaoglanian, is working on her second case with her Armenia-based counterpart, Dr. Satenik Harutyunyan, treating a 10-year-old female patient with a grave illness. In the pursuit of making HyeBridge Telehealth resources available to as many patients and healthcare personnel as possible, Armenia Fund USA formally announces its collaboration with and support from the government of Nagorno-Karabakh as it further expands its telemedicine activities in the region, adding the service of live consultation sessions while implementing new online scheduling tools that grow the project’s capacity at a lower cost, furthermore facilitating its transfer elsewhere. The web-based online meeting software allows for the possibility of five to ten participants joining the network on a rotational basis, significantly expanding the HyeBridge Telehealth user base and community.